Paolo Pavan born in Rome in 1970. He has been studying music since he was very young, soon was dazzled by jazz music and he had teachers like Stefano Sabatini and Riccardo Biseo. He attended a training in composition and electronic music with Michelangelo Lupone. He achieved the degree in piano and pursued his classical studies with Kostantin Bogino. He collaborated with several folk, rock, pop and jazz band from Rome playing in live concerts and studio recordings. Paolo has played in numerous festivals including The Eddie Lang Jazz festival, Fabbricando festival, Se telefonando festival. In 2000 was a finalist in the TIM international music. 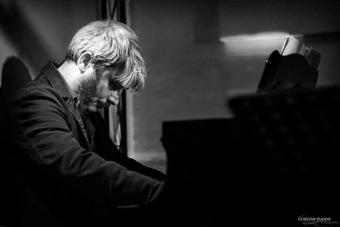 In 2002 he performs a concert for piano:"Jazz improvisation on classical theme" at Accademia Angelica Costantiniana for the"IV Festival Internazionale di Pianoforte e Musica da Camera". In 2003 he start playing together with the tenor saxophone Davide Marinacci. They records the CD "Inside" original jazz composition. They carry out a project for rearranging T.Monk and J.Coltrane pieces for quartet (drum, bass, piano and sax). Since 2003, provides consultancy in various television programs of the RAI TV. In 2008, participates in the workshop of the pianist Kenny Barron at the Tuscia Jazz festival.